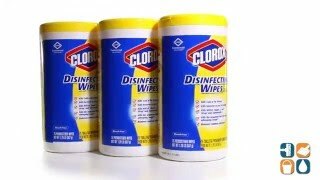 These Disinfectant Wipes from Clorox are the most effective, pre-moistened wipes for sanitizing, disinfecting and cleaning a variety of household surfaces. This simple to use bleach-free cleaner offers all of the capabilities of multiple cleaning products in one convenient wipe. 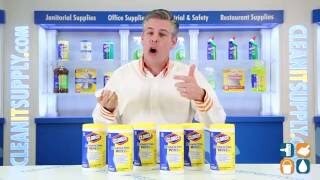 Proven to eliminate up to 99.9% of bacteria, including those that cause cold and flu viruses, staph and salmonella, Clorox Disinfecting Wipes are the quick and easy way to clean and disinfect a variety of surfaces, including finished wood. These Disinfecting Wipes also have a clear-drying formula that cleans and disinfects on shiny surfaces like glass and mirrors. Spills and messes happen all the time. Keep Clorox Disinfecting Wipes on hand to clean them up quickly and completely. Ideal for day care centers, offices, schools and restaurants. Stock up today and save! We wipe down hard surfaces. Nice scent.